Helloooooo. How’s the morning going?? Don’t forget that there’s still time to enter this awesome White Plum giveaway, and your special discount code expires in 2 days! 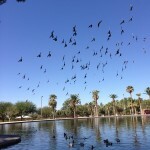 Hope you’re enjoying the day so far. After being away for a while, it’s always nice to be home with my favorite people and back in the routine. I took Sunday off from the gym, and was needing it after the various workouts at IDEA, but was back to business as usual yesterday. I can already tell I’m going to be sore from the latest BODYPUMP release. I think my favorite track is the triceps track, and even though I’m so so sick of the song (“Lips Are Movin’”), I think it’s a great balance of my favorite triceps exercises. This release may be my favorite since 89. <— I loved that one. So today, I have a new recipe for you! It’s a version of my beloved amazeball, with some new ingredients… and it tastes like cake. Energy bites aren’t the most attractive food. 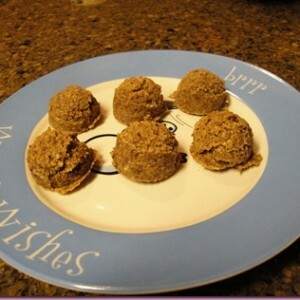 They’re a jumble of pantry ingredients, rolled into a sphere for convenience sake. According to my Instagram friends, the latest one looks like a turtle? (Which make me laugh so hard I choked a little on my LaCroix.) Ok, so even though they aren’t the prettiest, they taste pretty gorgeous, and make you feel good, too. I’m always about a snack that gives me an energy boost from natural sugars, in addition to satisfying healthy fats and protein. 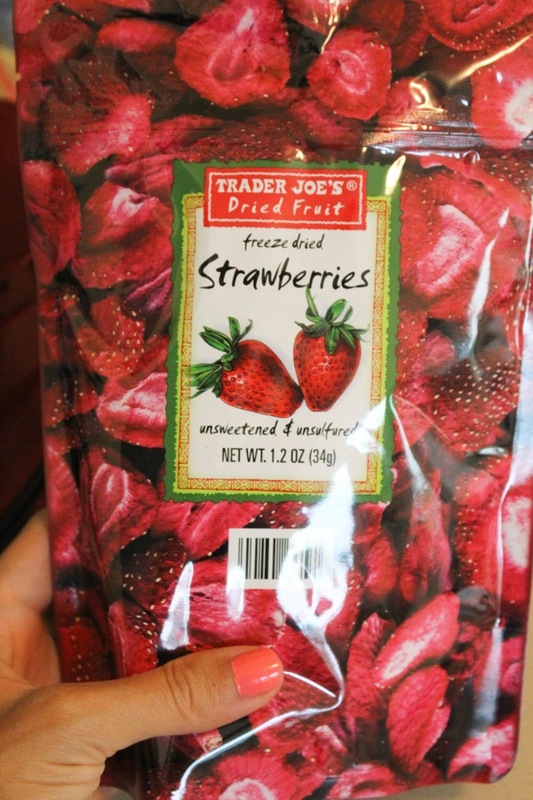 For the strawberry flavor, I used these crispy freeze-dried strawberries from Trader Joe’s. They yield a summery burst of strawberry flavor, but if you don’t have them on hand, feel free to add dried fruit or chocolate chips instead. On the other hand, I highly recommend keeping the almond extract if you have it! This is what gives it that delightful cake-ish flavor. A delicious and satisfying snack option! It’s perfectly portable and tastes like a beloved summer dessert, with a boost of healthy fats and protein. 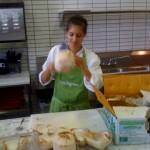 In a food processor, chop all of the ingredients until a dough forms. Using a melon ball scooper or your hands, shape into 6 spheres. Store covered in the fridge for up to one week. No freeze-dried strawberries? No worries. 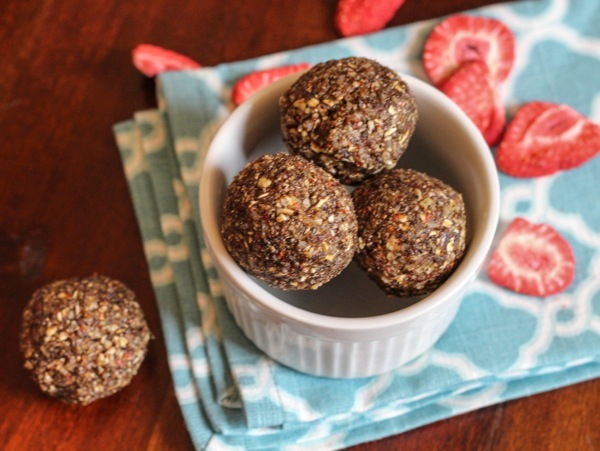 Try a dried fruit you love, chocolate chips, or another freeze-dried fruit. What’s your snack today?? I’ll be having one of these crumbled onto some plain goat greek yogurt. Hope you have a lovely morning and I’ll see ya later today on the Family page. Workout challenge: this barre squat burner! It’s short, but will set your legs on fiiiiire. IDEA World and Blogfest 2015 Recap →	← When did your kid drop their nap? Ohh this sounds yummy! I need to try making it! These look so goo! They kind if remind my of the costing on those strawberry shortcake ice cream bars the ice cream man sold when I was a kid! I LOVE almond extract. It brings out such a gorgeous, decadent flavor to anything. sure- you can probably use more oats instead! Yum! These look tasty! We were obsessed with energy bites for a while, but then we got burned out on them. I think we might have to give these a shot, especially since the recipe only makes six! My snack today is fresh blueberries. I think I will try these this weekend. Yum. my snack today will be cocoa dusted raw almonds and a fuiji apple. So I’ve been away from BODYPUMP for about 2 months now (was easing back on exercise a bit) and decided to try out the new release on Sunday. I made the mistake of using my regular squat weight and I. CAN’T. WALK. I even did the lunge track without weights! Although I’ve been doing yoga, barre, and walking .. the weighted squats wiped me out. Needless to say, I’ve got a few days of light stretching ahead of me. Phew!! Oooh these sound so good! I love those freeze dried strawberries! They’re perfectly crunchy and slightly sweet! 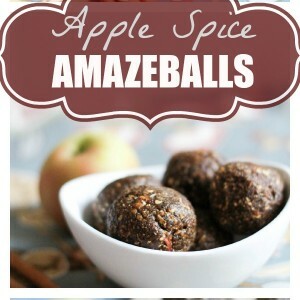 Such a good idea to put them in amazeballs! Yum-o! I haven’t seen these at TJ’s but will need to be on the lookout. Do they have sugar added to them? looks so good. 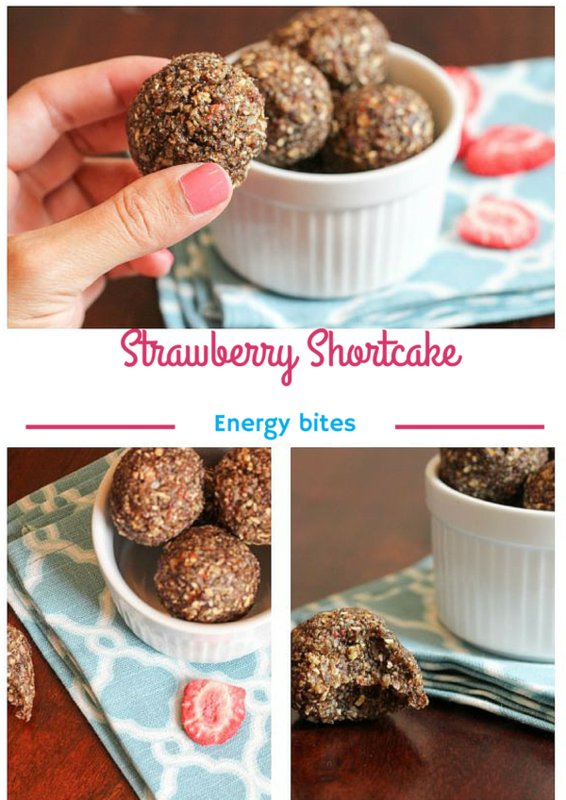 i love healthy treats.. i need to start making these energy bites.. come in so handy at work. I’m loving greek yogurt with blueberries these days! TJs has bloobs the size of grapes! How was graduation? Excited to hear how it went and also what you have planned for your future with yoga! I saw that Instagram comment. I think the poster was saying the 4 balls together resembled a turtle. The half eaten pieces in your hand is the body, head directly in front and 2 legs off to the sides! That’s how I interpreted it anyway. I am leaving and will be away for a week starting tomorrow so my snacks are hodgepodge leftovers that I need to eat through! Have a great day and thanks for the yummy recipe. 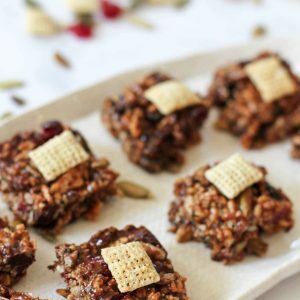 Could you make these (or any of the energy bites) without the maple syrup to cut down on sugar? Um, yup those sound amazeballs lol. I may have to give them a try. 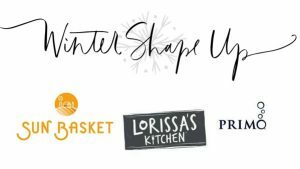 Wonder what they’d fit into under 21 Day Fix? Any ideas? Oops sorry just saw other suggestions! These sound so good! 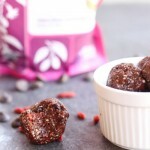 I love those freeze-dried strawberries form TJs! Delicious! Made a quad batch today for our road trip this weekend. Hopefully they’ll last until then. I also crumbled one into a bowl of Greek yogurt with honey and peanut butter. YUM. 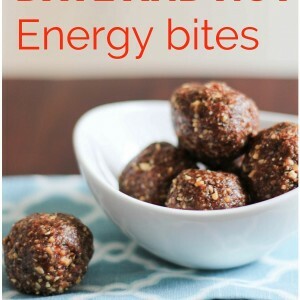 Wow, these energy bites looks absolutely scrumptious! Thank you for sharing the recipe, I can’t wait to try them! 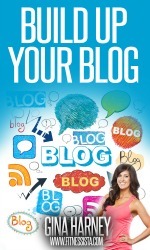 I just found your blog through a friend, it’s beautiful! I’m glad to see all the fitness related posts – i love it. 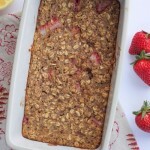 I make something similar to these at all, and I really like the add of the strawberries from trader joes! These are like addictive, btw. So I love them but it’s so bad I eat them too quickly. Keep em coming! 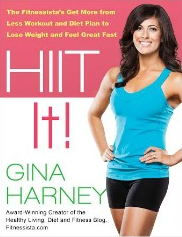 Can’t wait to read! 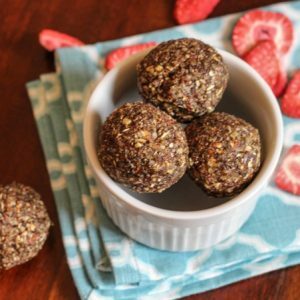 These look great and I just happen to have everything I need to make them in my pantry! Perfect, so I’ll be making these this week. Thanks! I made these over the weekend. Wow. Just Wow! They are AWESOME! I make them for the week and put them in the freezer to nosh on before I work out. However, I have been having them for dessert. I am going to need to make some more tomorrow night. Whoops. haha yes!! so happy you’re enjoying! This recipe looks fantastic. I’m always looking for new healthy snack options. Thanks for posting the recipe.